In a nutshell: Godzilla by-passes Tokyo this time to play tennis with a giant shrimp. Toho decided to give its Godzilla franchise a face lift in 1966. 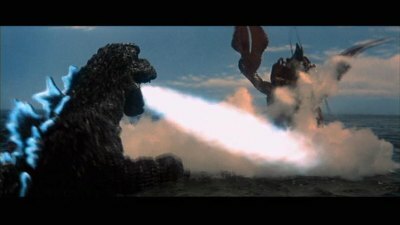 Though the series was still popular, it had gotten into a rut, The movies all had a similar feel, with much of the movies focusing on Godzilla's romping across Japan. To remedy this they replaced director Ishiro Honda who had been at the helm of the previous Godzilla movies with Jun Fukuda. Jun, who would go on to direct five of the big guy's movies all together, had previously done gangster movies, and it shows in his first Godzilla movie, Godzilla Vs the Sea Monster. Columbia Tri-Star has just released this first 'new direction' film on DVD with a beautiful widescreen image and the original language track. Even though the film looks and sounds better than it ever has in America, that won't save viewers from a fairly pedestrian movie. Ryota is looking for his brother, Yata, who has been lost at sea. Everyone thinks Yata's dead, but since a medium can't locate him in the spirit world, Ryota's sure that he's still alive. Convinced that he can find his brother, Ryota stows away on a yacht along with a pair of dance contest losers. The person they assume is the owner is actually a gun toting crook, on the lam from the law with a suitcase of stolen money. The crook lets them spend the night on the boat, but Ryota casts off in the middle of the night to find brother. After all, the Pacific Ocean can't be all that big, can it? The boat sails on for a while until a storm brews up and a mysterious giant claw wrecks the ship. The four men wash up on Lechti Island, which just so happens to be the base for a terrorist organization, the Red Bamboo. (A name chosen to strike fear in their enemies obviously.) The Red Bamboo have kidnapped the natives of Infant Island, Mothra's home, and are forcing them into slave in their base where they manufacture the formula that wards off the giant crab in the bay. When the four men see this, they decide to try and help the slaves escape. The only problem is that a giant prawn, Ebirah, is guarding the island and only the terrorists know how to leave safely. If you are wondering where Godzilla is in all this, so are most viewers. He doesn't actually appear until half way through the movie, when the good guys stumble upon him sleeping in a cave. They decide to wake him up, figuring that if they can't defeat the Reb Bamboo, maybe Godzilla will. After calling down lighting from the heavens to awaken the slumbering monster, the G-man fights a (real bad looking) giant buzzard, and eventually takes on Ebirah, the Sea Monster from the title. While this isn't the worst of the classic Godzilla movies, (that would be Godzilla's Revenge,) this is a low point in the series. There's a lot that just doesn't work in the movie. The first half seems more like a knock off of a 60's James Bond movie more than a monster show, and when Godzilla does appear, his battles are almost comic in effect. Supposedly, this was going to be a King Kong movie, which makes a lot of sense. Lighting, which was used to wake up the sleeping Godzilla, was a source of strength for Kong in King Kong Vs Godzilla, and Godzilla's longing looks at the female lead also fit more with Kong's personality. That doesn't really explain the film's failure though. The biggest problem is that Godzilla seems like a minor character in his own movie. A lot of the scenes with him in it feel forced, like they are trying to give him more screen time, but they really don't have any reason to besides the fact that he's supposedly the star. Both Ebirah and Mothra are both integrated into the plot, but there's no real reason for Godzilla to be there. When comparing this film to many of the earlier Godzilla movies, it is easy to notice that this one doesn't have the epic feeling the previous films had. 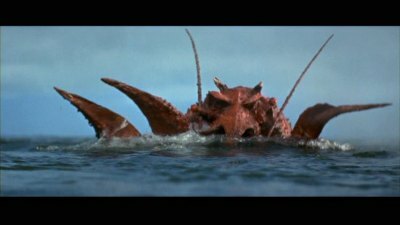 Godzilla isn't fighting to save the Earth or even destroy Tokyo, he's mucking about in the sea with a shrimp. This is the first movie that really plays up the cheese factor too. The tennis scene between Godzilla and Ebirah is just ludicrous. This is something that director Fukuda explored even more in his next film, Son of Godzilla. Even with these flaws, it's hard to hate this movie. One thing that Fukuda does succeed in doing is put a sense of fun into the film that's hard to deny. While no where near the best Godzilla movie, fans of giant monster movies should still check it out. The DVD has both the original Japanese soundtrack and an English dub, both in stereo. After years of watching this movie with a bad dub job, I relished the chance to see it in its original language. Watching it in Japanese makes the movie much more enjoyable. I did spot check the dub, and it is as bad as I remember it, with guys talking in high squeaky voices and whining all the time. Both soundtracks were clean and clear. While it wasn't as dynamic as a recent film, the fight scenes had good amount of impact for a film of this age. 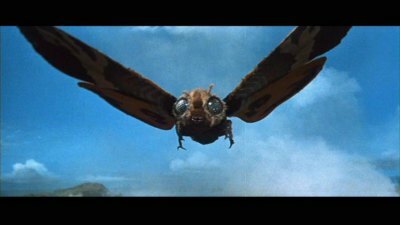 The Mothra's squeals and Godzilla's roar are both reproduced nicely without any distortion. A fine sounding disc. The picture quality is really outstanding. This DVD presents the movie in the original Tohoscope ratio of 2.35:1 with anamorphic enhancement, and the image looks great. The colors are brighter and more full than I've even seen them, and the detail is excellent. I noticed a couple of very minor print defects, a couple of spots in a few scenes, but they were minor. A really good looking DVD. This disc is barebones, including only a few trailers as extras. Normally I'd be bothered by this, but since it has Japanese soundtrack and preserves the original aspect ratio, something that was unheard of on Godzilla movies until recently, I'm not going to complain. Godzilla Vs. the Sea Monster is admittedly a low point in the first Godzilla cycle. The hero doesn't appear until the movie is half over, and the plot is fairly incoherent in parts. (A dance contest??) It does have some fun moments though, and the battle at the end isn't all bad. The movie looks as sounds better than I've ever seen it, but this great transfer can't make up for the film's short comings. Casual fans of the big green guy can probably stand to miss this, but die hard fans should make a point to rent it.